F23 Stick Stick: warm reflections of the Ayous wood design lamp Stick is the new lamp collection of designer Matali Crasset for Fabbian Illuminazione. It stems from an Ayous wood module, the shape of which is inspired by that of a pair of pliers: two bent elements stretched by a central support. “This detail – explains the French designer, Matali Crasset – is the vocabulary that gives life to a lamp collection based on its repetition. While the texture of the wood permits diffusing a soft and warm light, the repetition of the module creates an effect of unexpected graphics and shadows. ”This line of products develops by reinterpreting different types of lamps such as floor lamps, wall lamps, suspension lamps and table lamps. It all starts with a single module which behaves like a pliant material: this way, the light source is covered and “tamed” and a veiled light is diffused from the smoothness of the wood. “The goal to be achieved – says Matali Casset – is for the light to develop in the interior, creating separate areas and, at the same time, to filter without fully delimiting the spaces; this type of effect is achieved thanks to “space-objects” which have this dual function. It is a return to the essence and a way of showing that design is first and foremost creative strength.” The collection consists of a table lamp, a wall lamp, four floor lamps and five suspension lamps featuring four different diffuser shapes. Light diffusion is by means of a frame decorated with Ayous wood strips. The lamp structure is in coated metal. 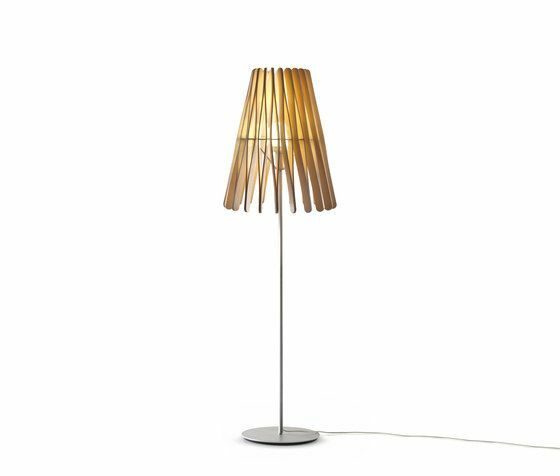 The pole of the floor lamps is in Toulipier wood or wholly in coated metal. The light bulb is energy saving.